We were informed by the authorities that our client, Mehdi Maleki, was released from detention and his deportation order stopped yesterday after Sweden’s initial decision to implement his deportation on 13 May 2011. These circumstances are thanks to the efforts of concerned people around the world who called or wrote to Swedish Embassies and the Swedish Immigration Office to demand a halt to the deportation; the efforts of lawyer Bo Johansson of the Swedish Refugee Advice Centre; the work of others including UNHCR and Amnesty International; and around-the-clock action by organizations such as the International Organization of Iranian Refugees – Swedish Section, the International Federation for Iranian Refugees, the International Coalition for the Rights of Iranian Refugees, and Mission Free Iran. 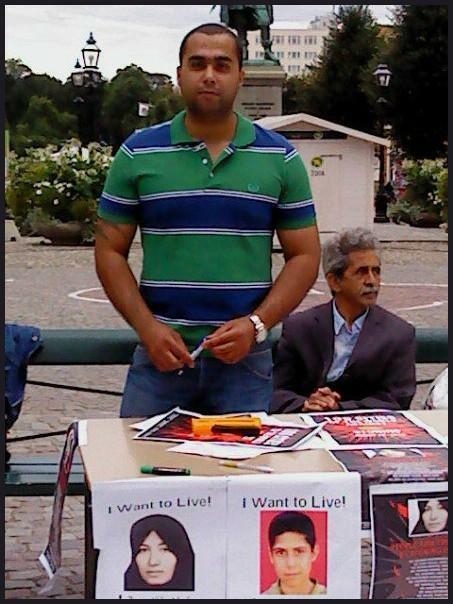 By halting Sweden’s deportation of Iranian human rights activist Mohammad Mehdi Maleki to Iran, the humane front has dealt the third such defeat this year to the cold, inhumane, and illegal politics of the Swedish government. This humane front has shown that honorable people around the world refuse to stay silent while crimes are perpetrated against those in our society with the fewest rights – in practicality if not on paper: refugees for whom deportation to Iran is tantamount to a sentence of arbitrary detention, torture, and, frequently, execution. We do not have to go back as far as the 1980s, when thousands upon thousands of political prisoners were slaughtered in the Islamic Republic’s prisons – constituting one of the worst crimes against humanity since WWII and constituting genocide, according to the legal findings of Geoffrey Robertson, Q.C. – to observe how that regime deals with any challenge to its authority. We only have to go back as far as December 2009 to find mouthpieces of the regime calling for a resumption of ’80s-style executions for those suspected of opposing the barbaric Islamic Republic. And we only have to look at yesterday’s news to see that there are 8 more corpses swinging from the regime’s dark gallows in Oroumiyeh and Miandoab… and only look back another few days to read the news of 9 more hung in Ahwaz for protesting against this murderous regime, among them a 16-year-old boy. And yet the Swedish government persists, in contravention of international law, with illegally handing over dissidents, apostates, and other human beings at clear risk of torture and execution to the blood-drenched hands of the Islamic Republic of Iran. The politics of the government of Sweden, made clear by its repeated efforts to send to death in Iran those in dire need of asylum, demonstrate the Swedish government’s continued ignorance of (in the best case), or complicity with (in the worst case), the crimes of the Islamic Republic. Every deportation of a person at risk of illegal detention, torture, or execution is an arbitrary detention by the government of Sweden, it is torture by the government of Sweden, it is execution by the government of Sweden. But the humane front, Swedish and non-Swedish, does not tolerate such crimes in silence. Working together, hand in hand around the world, we have saved the lives of three refugees on the verge of deportation just over the course of the past few weeks, underscoring how indefensible the current system of refugee status determination is in Sweden. Together we have proven that there is something fundamentally wrong with the politics of the Swedish government as it reveals through its immigration policy and practice both its domestic and international priorities: appeasing both the racists, Nazis, and others belonging to the most reactionary elements of domestic society, and, at the same time, ingratiating itself to the Islamic Republic of Iran – the most reactionary entity on the international scene. Neither the honorable people of Sweden nor those around the world tolerate these retrograde politics, which belong to an era that should not – must not – be exhumed from the dustbin of history. Veröffentlicht am 14. Mai 2011 in Aktionen, Gesetze, Medien, Politik und mit Abschiebung, Aktionen, Asyl, Flüchtlinge, ICRIR, Iran, Menschenrechte, Politik, Schweden getaggt. Setze ein Lesezeichen auf den Permalink. Kommentare deaktiviert für As Another Refugee Deportation Halted, Demands for the Swedish Government’s Accountability Advance.